The weekend kicked off with the sprint race on UWE campus near Bristol. I had a good race, but I felt a bit sluggish after a few weeks hard training and the exertions of the weekend before. No mistakes, but a few places where I could have saved time. 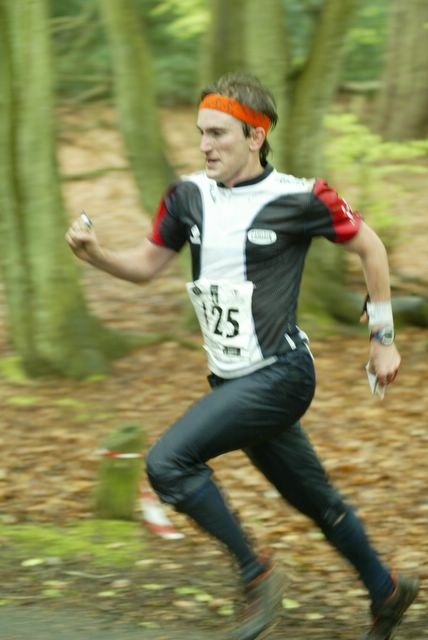 3rd place, 19 secs behind Østerbø, 2 seconds behind Oli Johnson. 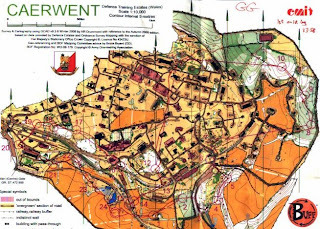 Feeling much better - legs feeling fast and good, orienteering flowing very nicely. 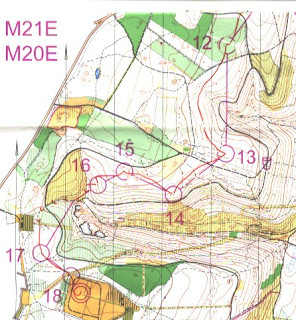 Beautiful fast open forests and a really nice course with lots of changes in terrain, leg length and direction. 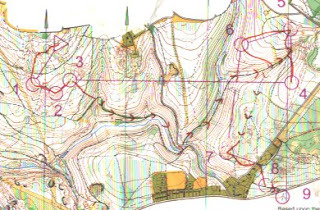 Only time loss control 16, green on slope not mapped very well - the boundary was really not very distinct. 1st place, 18 seconds in front of Oli Johnson and 1 min 24 in front of Matt Speake. The big one. 16km and quite a lot of climb. I started last as the middle winner, and I started well, catching a glimpse of Oli as I ran up to number 4. I was leading the race at control 12, but then it all started to go wrong. The good feeling in my legs from the middle race was gone, and suddenly running was hard work. I got a thorn in the base of my foot which dug in more with every step. Then we were launched into the complex mining detail around controls 13 and 14. 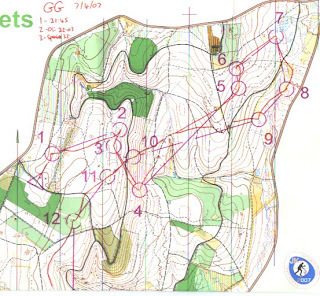 I knew it was going to be the most difficult part of the course, but I still struggled to work out what was going on. There were a few clearings around number 13, and I couldn't believe that they weren't on the map. I lost around 45 seconds there and took 14 very slowly. I also was very careful on 17. Then it was time to stretch the legs again, but I was starting to run out of energy and starting to be a bit scrappy. I chose a poor route to 19, and then proceeded to climb way too high up the hill and having to drop down again. 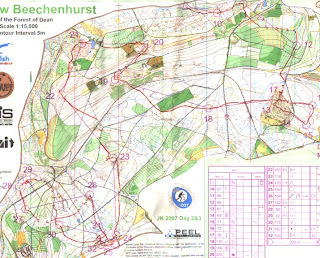 20 I was just slow, and 21 I really couldn't work out what was going on in the circle - the control was really tucked away. 22 I ran to a control that wasn't mine and I was starting to rush things. Wobble at 23 as well, then it was a long slog up the hill to the assembly area. The commentary confirmed what I already knew, that my run was far from good enough, and I just tried to have a good last loop. By this point my feet were getting really sore (not worn o-shoes much recently), and I was getting tinges of cramp in my hamstrings. 27 was a bit of a bingo control and I wobbled a bit, but 29 was a real bingo control, and I lost direction and lost over 1 minute there (my biggest mistake). I ran really hard after that and was getting really good split times, except for the penultimate control where I banana-d it to the right. 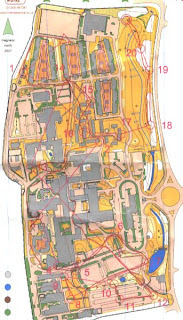 My shape was good and at times I was orienteering very well, but I made far too many little mistakes. I was running around the same speed as Oli and Speakey (1st and 2nd). I finished 4th, 6 mins behind Oli, and I was 3rd overall. With quite a lot of hesitancy about the strength of our team, we decided that I should run first leg. I had a good race, I was very tired and didn't feel like I was pushing very hard, but I was nearly clean and I came back first, about 20 seconds ahead of Ewan McCarthy. Jan-Egil Wagnild ran a good second leg, holding on to the lead (although a few teams gained some ground). Andy Simpson was less than thrilled to be going out in the lead, but despite that he ran a good time for the third leg. At the spectator control, he was in 2nd, just behind the leading Edinburgh team, and in the last loop he was passed by the Wing team and came in in 3rd place, just in front of the Halden team. Julian Simpson ran our last leg, and it is fair to say that he was the weakest link in our team. Tired after a hard weekend, he ran bravely to come in in 6th place (and 2 teams in front of us were later discovered to have mispunched, leaving us in 4th place - our second best result ever at the JK!). impressive work over the weekend boyo and a shame you couldn't hold it over the classic. sure you'll have it at the nordics. quick debate for you. would you prefer not to start last on the elite classic race? i remember that nash won the middle in 04 and finished second overall to jamie. Hard luck on not winning all 4 days at the JK GG. eddie - it is definitely tough to start last in the classic, and i would say that it is doubly tough when you know the person in front of you is jamie stevenson. The pressure is definitely on. I wouldn't say i would prefer not too though. Did Nick Morgan not finish second in the end? aye i think you right about morgan.